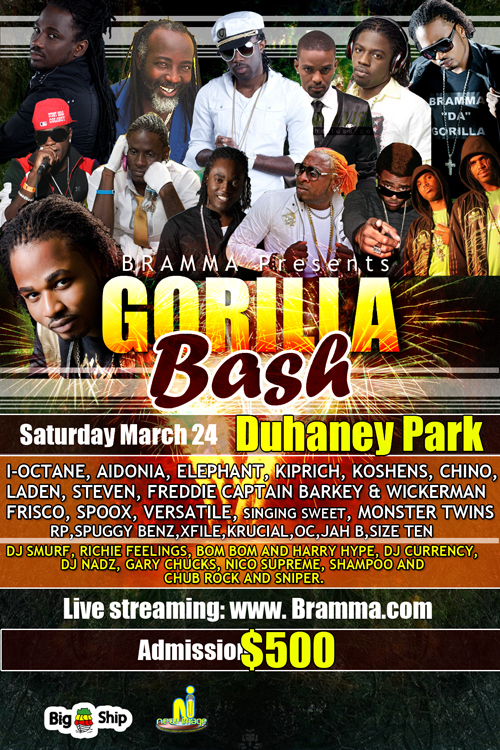 It's today folks, the long awaited Bramma's Gorilla Bash at Duhaney Park Community Centre in Kingston. Bramma has never been this busy trying to get everything in place for an highly anticipated show. Performances from I-Octane, Konshens, Idonia, Kiprich, Elephant Man, Stephen 'd Genius,' Laden, Chino, Freddie McGregor, the Canadian Rapper called Spooks and much more has kept dancehall fans in the community talking all week. 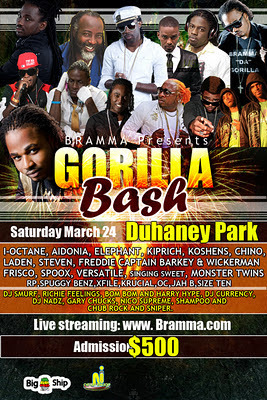 Bramma's hope is for everyone in attendance to be on their best behaviour, "we have the authority of the police and the Duhaney Park Committee so we really need patrons both those living in or out of Duhaney Park to corporate." Gates open at 8pm and there will be food and liquor on sale. Music by Hi-tension sound from Spanish Town with guest selectors, DJ Smurf, DJ Currency, Richie Feelings, Bom Bom, Harry Hype, DJ Nadz, Gary Chucks, Nico Supreme, Shampoo and Chub Rock and Sniper. Be there! !